According to the manufacturer, this supplement works by increasing blood flow to the brain and supports levels of key neurotransmitters involved in mental performance. What does the “AVH” stand for in Procera AVH’s name? This is an acronym for the main ingredients in the supplement: Acetyl L-Carnitine, Vinpocetine, and Huperzine A. All of these natural ingredients have been demonstrated as cognitive enhancers that work with little risks or side effects. Some consumers appreciate the simplicity of a nootropic stack product like Procera AVH, which combines all of these ingredients into a single pill. However, dosage inflexibility and a high price tag may make this product more trouble than it’s worth. Read on for a detailed description of how each Procera AVH ingredient works. Plus, we’ll break down the benefits for price and efficacy of buying these ingredients individually. 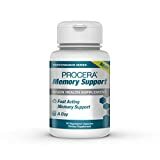 The main component of Procera AVH ingredients listed on the packaging is Acetyl L-Carnitine. This is a well-known nootropic supplement that has been in popular use for some time. Also known as ALCAR, this compound transforms into Acetyl-COA in the body and binds with natural choline to create acetylcholine. This powerful neurotransmitter is responsible for nurturing the vibrant growth of neural tissue and structures. Optimized levels of acetylcholine are linked to improved nerve cell signaling, better memory, and sharper mental focus. There are literally dozens of nootropic supplements which seek to improve the activity of acetylcholine in the brain. The original nootropic supplement, Piracetam, began this trend by linking improved acetylcholine balance with enhanced cognition. There is no debate about the efficacy of Acetyl L-Carnitine supplements – when they are taken in pure form. However, the manufacturers of Procera AVH do not release exact dosage info about their ingredients, or how those ingredients interact with the many additives in the product. For this reason, it is difficult to vouch for the efficacy of Procera. Vinpocetine is a plant-derived herbal supplement which is focused upon improving circulation. Its effects are specifically effective within the brain. The issue of good blood flow and circulation in the brain is of paramount importance to overall mental health and longevity. A steady supply of oxygen-rich blood must be supplied to neural tissue in order for proper metabolism and growth of neural structures. Cerebral Insufficiency is the condition of impaired circulation in the brain and is responsible for many of the age-related degenerative cognitive disorders we see, as well as stroke. For this reason, Vinpocetine is a popular component of many nootropic stacks. In addition to being one of the three key Procera AVH ingredients, it also appears in more well-known and established nootropic stacks, such as Alpha Brain. Huperzine A is a derivative of an organic moss plant. In the body, it acts as an NMDA agonist. It is involved in the production of Nerve Growth Factor, which spurs the easy growth of nerve cells. Huperzine acts as an acetylcholinesterase inhibitor, protecting balanced levels of acetylcholine. This makes the supplement a good partner to Acetyl L-Carnitine. The user benefits include improved memory function and better learning abilities overall. Huperzine improves communication within the brain from neuron to neuron and helps synapses to grow. These effects result in a feeling of “fluid intelligence” for the user. Huperzine A is also a common addition to various well known nootropic stack products like Alpha Brain. While we can agree that Procera AVH ingredients are effective on their own, the price per dose may make use of this proprietary supplement prohibitive for most people. The list price for 20 doses (a dose is comprised of 3 tablets) ranges from $39.99 to $59.99. As the product is supposed to be taken daily, this means that a one month supply could run as high as $70. This number might be worth it if the Procera AVH user reviews supported the efficacy of the product. Unfortunately, most online vendor sites which sell the product are littered with negative reviews warning of side effects like blurred vision and high blood pressure. The culprit is not likely the basic nootropic ingredients, but the long list of mysterious additives that are included in every pill. These additives appear to be problematic for most users. Beyond that, any adjustment to dosage of the core ingredients is not possible with this product. Individual dosage amounts are not indicated on packaging, so it is impossible for users to intelligently modify dosage amounts once the product has been purchased. A much smarter bet is to buy the main Procera AVH ingredients individually. This way, users have the flexibility to craft their own best dose of Acetyl L-Carnitine, Vinpocetine, and Huperzine A, at far more reasonable bulk prices. As these ingredients are all legal to purchase prescription-free, there are many safe deals to be found on reputable nootropic vendor websites. If you are still interested in the convenience and comprehensive benefits of a nootropic stack product, the far more well-known Alpha Brain represents a broader range of ingredients, with none of the mysterious additives. This powerhouse combo of memory enhancing, clarity-boosting natural supplements has become more popular with the public for a reason. Thousands of reviews attest to its benefits, taking a lot of the guesswork out of your new supplementation plan.